The Boca Divers team welcomes you ! Let us guide you diving, snorkeling and kayaking the bay's beautiful and life abundant waters. and one thing in mind ...you have the best experience possible. Exploring the ocean with BOCA DIVERS is intended to be your most relaxed, safe and pleasurable event. The service is truelly personalized, quality equipment, flexible scheduling and. . . paradise all around you! We are excited to assist you in the planning of your Puerto Vallarta ocean adventures. Send us an email ! We offer scuba, snorkel and kayak tours for small groups or private parties ~ family oriented, professional tours & expeditions. We highly value any comments on your dive, snorkel and kayak experiences with us. Please send us your testimonial, along with a picture and we'll post it on our Testimonial-Customer-Comments page. 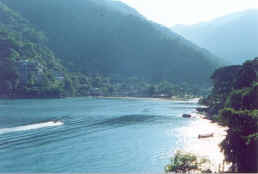 When visiting Boca de Tomatlan, enjoy the boat services offered by "Servicios Turisticos-Barra de Tomatlan,S.C.L." A unique experience, touching life in "authentic" coastal Mexico, where the quaint villagers will offer you their warm and hospitable service.